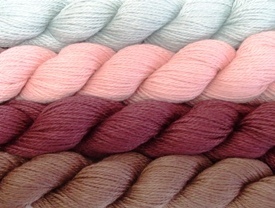 Plume, quartz, raisin, and truffle are the four new colours of Blue Sky Alpacas Alpaca Silk. 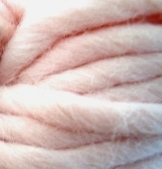 This is a gorgeous yarn with lustrous sheen and elegant drape made from 50% alpaca and 50% silk. 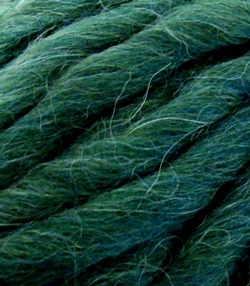 Blue Sky Alpaca’s newest yarn is the new Organic Cotton Multi. The same dyed cotton that we all know and love, just with added splashes of colour. These are going to be extremely popular for all sorts of kids clothing. Why not try the Cotton Baby Set? We have all 7 colours in stock, so take your pick! 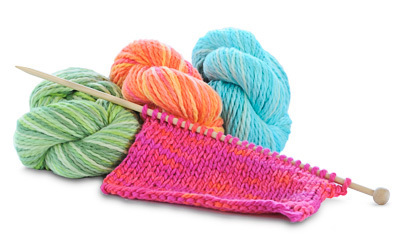 This yarn is available in Point Grey and will be arriving in Edgemont on Friday. On the left side, we have blossom, a sweet and girly pink. And on the right is a beautiful dark green called seaweed. Try knitting this on a 20mm needle to create a gorgeous neck scarf. Cast on 10-12 stitches and knit in rib. This entry was posted on Wednesday, January 6th, 2010 at 4:26 pm	and is filed under Uncategorized. You can follow any responses to this entry through the RSS 2.0 feed. Both comments and pings are currently closed.